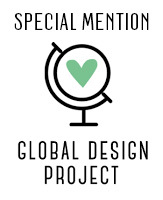 And I earned a special mention for this card from the Global Design Proct #gdp045... Thanks guys! After a wonderful two weeks spent with my loved ones in South Africa, I am very happy to be home!! 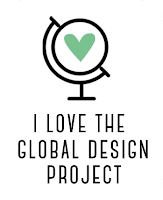 Still trying to get into things though... Lucky for me nothing inspires like a Global Design Project Challenge! This week (#GDP045) it was a colour challenge! I knew before hand that I wanted to use the Pretty Kitty stamp set (being a cat mom) and this made the challenge very difficult for me... To colour one of these pretty images using only three colours??!! I decided to keep it really simple (no difficult water colour techniques here!). I also wanted to keep it CUTE and GIRLY (being mom of a girl too!). I might just get into trouble... there was that time that Charlize changed my I phone wallpaper (a photo of Harry our tabby) to a photo of her..
Next time I will make kitten a little tabby cat! Pretty blossoms to make the White space more interesting! And a teeny, tiny butterfly wing coming off the page! I love using my Clear Wink of Stella Glitter Brush on Shimmery White cardstock. It is very easy to pick up the ink with the Clear Wink of Stella Brush from the lid of my Classic Stampin' Pads (you can find another example HERE). I stamped part of the image (the little butterfly) on a piece of scrap Shimmer White cardstock, cut the little wing out and adhered it partially over my main image. To fill up the empty White space I used Delicate White Doilies and punched blossoms from the Tree Builder Punch. Doesn't this card make you feel happy! I really had fun creating it! Please leave your compliments (I mean comments)! at the bottom! I love hearing from you! Loved this cute card! I just got this stamp set and can't wait to try it out! Thanks for the inspiration. Thanks Michelle! It would be a dream come true! This colour combo was made for your sweet kitty card. So adorable! 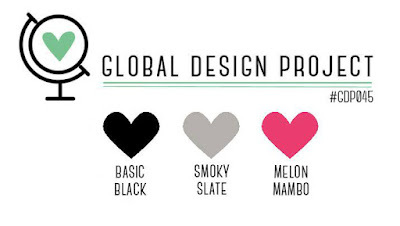 Thanks for joining us at Global Design Project and good luck for the Guest DT pick! Thanks Paula! So many wonderful entries this week!